Above: Basic beauty for a tropical vacation. Here is my vacation makeup tutorial; filmed earlier this week, on location on the balcony of my hotel room in Palm Beach, FL, it reflects the skincare and beauty choices I gravitated towards daily. I am loving these products for the summertime months as they withstand heat and humidity while still looking natural on the skin! Above: A distant view of my poolside environs. Above: The By Terry Lip-to-Tint in Beach Games (used HERE) and Pink Palace. Above: From the Summer 2014 French Riviera Collection, this shimmery lip stain is so easy to wear. 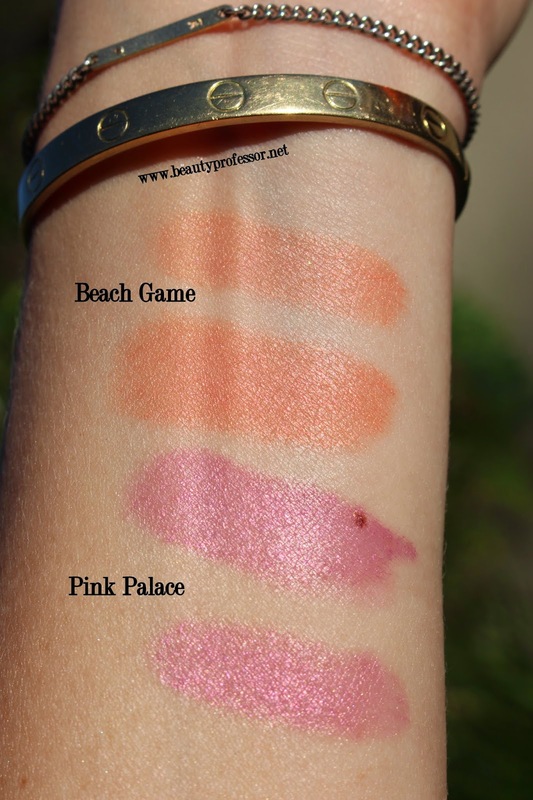 Above: Swatches of Beach Games and Pink Palace in direct sunlight. Above: Chanel Fall 2014 Glossimer in Songe #191 is an iridescent oyster pink. Above: A swatch of Songe in natural, outdoor lighting. Above: By Terry Lip-to-Tint...a tropical vision, indeed. Bottom Line: I hope you enjoyed this tutorial and would love to hear what some of YOUR vacation skincare and beauty essentials are! Good things ahead next week including new foundation, skincare and lip color galore...any requests for future posts? Now that I have a stretch of time at home, I am beyond excited to create content like crazy! **PR samples provided for review (most purchased by me), however, as always, all of my opinions are expressly and unequivocally my own. Hi Rachel. I have a question for you. I noticed in your reviews/tutorials you use a blending brush with the Blackstar. Do you find that this takes down some of the glitter? I just dipped my toe in the By Terry and Surratt line. I got the Blackstar in Bronze Moon and Misty Rock. I love the way it applies, the color, and the wear time. But oh my gosh, glitter bomb! I was so surprised at the high level of shimmer. I looked at a lot of online swatches and I didn't see that in the pics. And in your pics it just looks like a beautiful and elegant gleam. I, on the other hand, looked like a cheap disco ball. I really don't want to return these because I love the formula but I have got to find a way to work with them and bring down that glitter. Any advice would be greatly appreciated! Thanks. Thanks for the question. I have indeed noticed that a blending brush can tone down the satin finish of the By Terry Ombre Blackstars...try lightly buffing it into your orbital area. I guess in comparison to other shimmery shadows I have, the OB's do not feel glittery at all to me...more of a clean satin gleam and absolutely no fallout/migration! If the buffing doesn't work, I suggest mixing in a touch of light matte eyeshadow to tone down the shimmer. The shimmery lip stains are so beautiful. I super love the colors and I find them so perfect for Summer/Spring. Nice location shoot for your makeup tutorial.